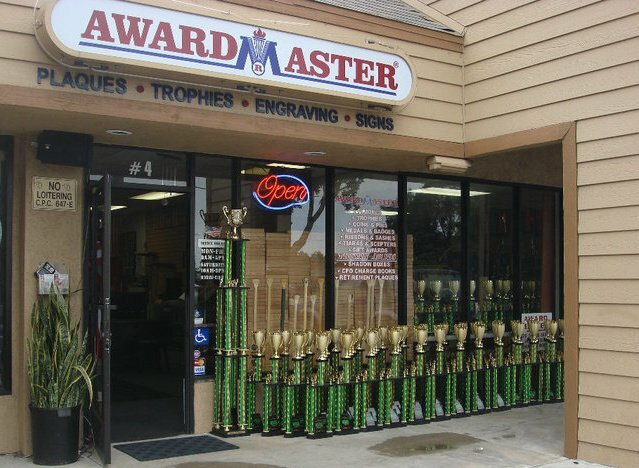 For over twenty five years, Award Master, Inc. has been serving San Diego as the leading provider of Quality Trophies, Plaques, CPO Chargebook Vessels, Military Shadowboxes, Military Paddles, Cups, Acrylic Awards, Medals, Signs, Automotive Decals, Banners, Engravings, Sublimations, and other related products. The Company is a family owned which makes running the business more focused on achieving and providing the best Quality products. Award Master stays ahead of the Competition; for in this business whoever can provide the best quality products with competitive price and one of a kind service becomes successful. Award Master Inc. has grown over the years starting out from manual operated engraving machines to High-tech Laser Engraving Machines. From providing the cutting edge plaques or banners to which ever design, for office promotions, to personal achievements, to banners for your business great or small, to winning championships; we have taken all the necessary steps to present to you the latest technology for every concept imaginable. Award Master has grown as company. It started as a Dream that turned to Reality. And for every successful business a mission statement is a necessity. We are in business "To Make Every Award Piece a Memory to You Last Forever." In 1994, Award, Inc. received an Award of Recognition as the Entrepreneur of the Year from the California Legislative Assembly and from the Chamber of Commerce and Industry. And over the years we have been widely recognized as one of the leading provider of top quality Award products. We offer service not just the State of California but also neighboring states as far as Hawaii. We are in business to meet your every need. Furthermore, other than domestic and regular customers; we support the requirements of all the military activities both shore and afloat. We also provide services to all Filipino American organizations, sports activities and all the civic and fraternal organizations. Award Master, Inc. is conveniently located outside NEX 32nd Naval Base, Our office is easily accessible by the 15 Freeway and 5 Freeway. We look forward to meeting you and Serving you. Thank You Very Much and God Bless us all.